Below is a collection of some useful iPad apps to use to turn your photons into comics and create carbonized pictures. Students can use to create beautiful cartoons to use in their multimedia projects or in activities that involve comic strips, digital storytelling, presentations and many more. All of these apps are easy to use and do not require any advanced technical skill. 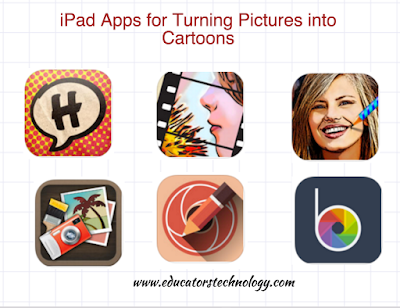 Some of the things students can do with these apps include: take pictures and turn them into cartoons, capture cartoon videos, draw cartoon sketches, customize and add different effects to pictures, convert photos into cartoon avatars, and many more.